Paasche Chicago airbrush compressor. 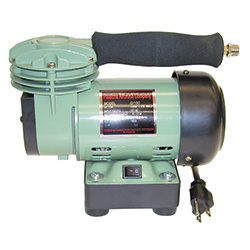 Paasche airbrush distributes a small airbrush compressor. Perfect for your airbrush hobby when spraying light materials. Excellent for use with F, H or V series airbrushes and many applications l. Delivers 15 to 25 PSI operating pressure.